New Torch Mode sends players into the darkness, and there's more content where that came from. A short while ago, we happily got lost within ByteSize Games' surprise iOS hit, Little Labyrinths, a maze-style experience where we never played the same board twice. Now comes word that creator Thomas Hoeg submitted DLC to Apple, and the content will appear on the App Store May 31. 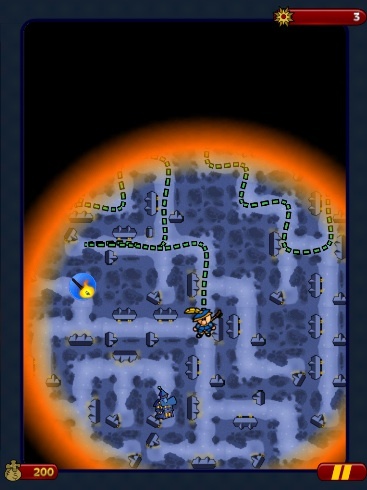 Called A Song of Slime and Fire, the update should bring a whole other level of maze-navigating goodness to the experience, starting with the new Torch Mode. Here, users must find their way through different mazes with the help of ever-shrinking light. "The interplay between darkness and light is the theme of this mode," said Hoeg. "The player's torch is constantly shrinking, and so speed is warranted even though they may not be able to fully see where they are going. There is nothing like almost being out of light before stumbling on a much-needed torch pick-up and racing to the finish line. This may be our most exciting mode yet, and it's like a whole different game from what has come before." In addition, the DLC adds new characters, achievements, objective, environment and various tweaks to improve gameplay. "We looked at the data and realized that people were having a different experience on the iPhone and the iPad," said Hoeg. "So we took special care in this update to refine the controls for the game to maximize people's enjoyment on the smaller devices. We think we've accomplished that and look forward to our iPhone and iPod Touch players getting a chance to see those refinements. And if for whatever reason the new controls aren't working for them, the sensitivity is now completely adjustable from within the game. We think that we've managed to get the best of both worlds here, and that people will really like these additions." As you'll see from our Little Labyrinths review, we had plenty of positive things to say about this game, and look forward to downloading A Song of Slime and Fire as soon as it's available.